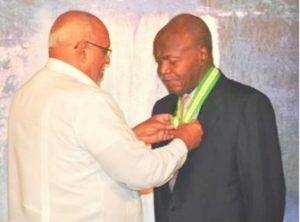 President, David Granger said that Guyana deeply mourns the passing of the late educator, author and diplomat, Mr. Edward Ricardo Braithwaite (E.R. Braithwaite), CCH, who passed away on Monday, December 12, 2016 at a hospital in Maryland, United States of America. The Ministry of the Presidency quoted President Granger as saying that Mr. Braithwaite was an eminent Guyanese and distinguished diplomat and extends condolences to his family at this time. He was the first Guyanese to hold the post of Ambassador to the United Nations (UN) in 1967. This led, subsequently, to his election as President of the UN Council for South West Africa in 1968. He later served as Guyana’s Ambassador to Venezuela. Then President of Guyana, Donald Ramotar bestowing the Cacique Crown of Honour on E.R. Braithwaite. President Granger, on behalf of the Government and people of Guyana, extends heartfelt sympathy to his partner, Ms. Ginette Ast as well as other family members and friends of the late Mr. Edward Ricardo Braithwaite (E.R. Braithwaite), CCH even as the nation reflects, with gratitude on his contribution to the country. Mr. Braithwaite lived a full and remarkable life, having authored ‘Choice of Straws’ (1965), ‘A Kind of Homecoming’ (1961), ‘Paid Servant’ (1962) and most famously, the 1959 ‘To Sir, With Love,’ which was made into the 1967 British hit film of the same title; starring Sidney Poitier and singer Lulu. Born in Georgetown on June 27, 1912, he attended the St. Ambrose Primary School in Albertown, before moving on to Queen’s College, Guyana, and then the City College of New York (1940). 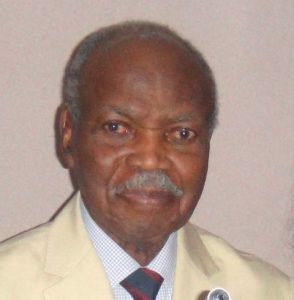 Mr. Braithwaite later became a School Master in London, during the period 1950-1957, a Welfare Officer at the London County Council from 1958-1960 and a Human Rights Officer of World Veterans Federation from 1960 to 1963.